Enjoy the peace and tranquility at whatever pace you find suitable at this stunning lodge in Kwazulu Natal. Situated on 150 hectares in the sugar cane country is Prince's Grant Golf Club and Estate. In the heart of this magnificent estate is The Lodge at Prince's Grant, combining old world charm with luxury living. This Dolphin Coast accommodation in KwaZulu-Natal has 15 lovely rooms overlooking one of South Africa's top golf courses. This lodge in Dolphin Coast is 45 minutes north of Durban and twenty kilometres (12 miles) from Ballito on an unspoilt stretch of coastline. Enjoy a most memorable golf experience and a wish to return to this lodge in KwaZulu-Natal. This lodge in Kwazulu Natal is a member of The Portfolio Retreats Collection and is 'Highly Recommended' by the Automobile Association Travel Guide. A secluded beach and private lagoon further complement the golf resort. There are many activities that guests can delight in during their afternoon leisure. 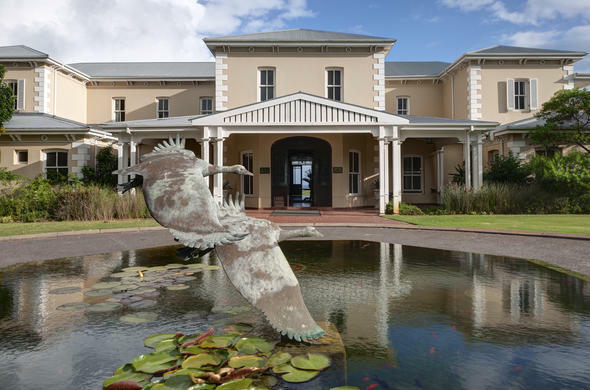 Prince's Grant Golf Club and Country Estate, a 'Site of Conservation Significance' features one of the country's best new golf courses, designed in 1994 by Peter Matkovich.